Product #60776 | SKU 996365005 | 0.0 (no ratings yet) Thanks for your rating! 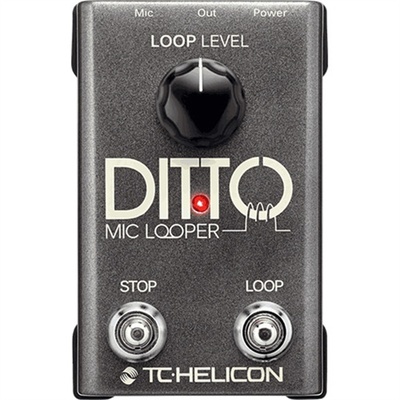 TC-Helicon 's Ditto Microphone Looper uses just two switches for building loops with a five-minute maximum initial loop time and unlimited overdubbing. It has a built-in microphone preamp with phantom power and delivers your loops in 24-bit uncompressed audio. With Automatic Mic Gain, you set your input gain only once at the mixer for balanced loop levels. You can use the Ditto in one of two modes. In Mic Control, all functions of the looper can be controlled using the button on the TC-Helicon MP-75 or the Sennheiser e835fx mic. In Normal mode, you can use any dynamic or condenser mic and control the looper using the footswitches. The Ditto Looper offers two workflow modes. In Default mode you press the footswitch to record your initial loop, press it again to play it back, then press it a third time for overdubbing. In Alternate mode, you record your initial loop, then press the footswitch to start overdubbing immediately. You can also restore your last deleted take during playback, and when erasing your last take, previously recorded material remains. The loop level knob controls the playback level and the LED indicates five modes – Record, Play, Erase, Loop in Memory, and Loop at Beginning Point. You can use the Ditto Looper not only with vocals but also with other mic'd instruments. The Ditto could be especially useful to solo musicians interested in adding more layers to their sound. It has an XLR output for connecting to a PA and is Mac/Windows-compatible for firmware downloads.